Multi-stone Diamond Pendants	There are 28 products. The charm of this rhombus pendant is in its purity and its simplicity. It features 28 round diamonds grain set, for effect, in all yellow gold. Including the bail, this pendant is 17mm high and is supplied with an extendable 16 to 18 inch fine French rope chain. 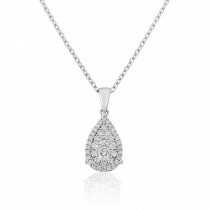 Forming a natural bail for a chain, the fluid design of this curved drop pendant has been half set with eleven round diamonds graduated in size and weighing around a third of carat in total. 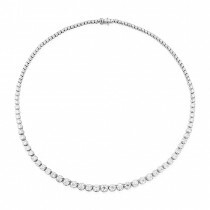 It stands 27mm high and comes complete with an adjustable 16 to 18 inch trace chain. 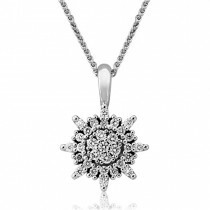 Containing thirty one individual, fully cut round brilliant diamonds, this attractive star-burst pendant is 12mm in diameter, excluding the bail. An 18 inch fine Italian spiga chain is included. This large, solid pendant measures 22mm in diameter, excluding the chain bail, and is made of gorgeous 14ct rose gold weighing over six grams. The pavé set diamonds weigh over a third of a carat and the pendant comes complete with a matching 18 inch rose gold chain. 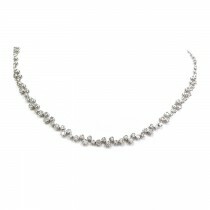 This pretty chain necklace contains 15 fully cut round brilliant diamonds, each in its own bezel setting. It can be worn on its own or it can be used to add interest and sparkle to any pendant. This one is 17 inches long but can be made for you in any bespoke length, gold colour or diamond content. Please contact us for details. An elegant 18ct rose gold claw set round brilliant cut diamond cross weighing 0.25cts suspended on a 16-18 inch chain. Cross height 14mm x 21mm. An elegant 9ct rose gold diamond set necklace by Mark Milton featuring two interlocking infinity symbols, one encrusted with diamonds and suspended from an 18-inch chain. With three round brilliant cut diamonds, graduated in size from 0.09cts to 0.26cts, this dazzling 18ct white gold, bar set pendant comes with an integral 18 chain and stands 15mm high. 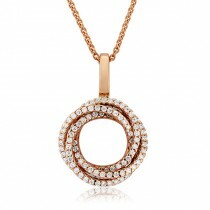 An elegant 9ct rose gold open loop diamond pendant. 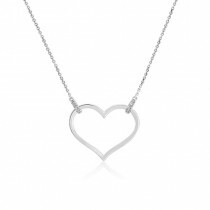 The pendant measures 25mm in height and is supplied on a 9ct rose gold chain which can be worn at 16 or 18-inches. Matching earrings are available, see product 2203585. An elegant 14ct white gold pendant featuring round brilliant cut diamonds, weighing a total of 0.50cts, pave set within three graduated marquise shaped drops. Chain not included in the price. Free UK Delivery. An 18ct white gold modern bezel set slider pendant featuring a single round diamond, weighing 0.41cts, which slides comfortably over the accompanying finely linked white gold chain. An 18ct white gold pave set diamond key pendant. This beautiful piece measures approximatley 3cm in height and contains 0.20ct of diamonds.